Look. I love tacos... sooooooo much. It's not like I'm this really unique specimen of the taco obsession variety because, let's get real, every human likes tacos. I like carnita tacos, al pastor tacos, carne / pollo asada, salmon tacos, fried tacos, bean tacos, shrimp tacos, egg tacos... you could put anything in a taco and I would eat it. One of our family's favorite books is Dragons Love Tacos, so it's genetic. I made these vegetarian tacos for dinner the other night and they were delightful! I used this recipe from Smitten Kitchen's wonderful cookbook but adapted it by layering in caramelized onions on the bottom and sauteed kale to amp up the veggies. I also drizzled it with a sriracha lime mayo sauce that I keep in a squeeze bottle and use A LOT (like, embarrassingly a lot). It goes great on all kinds of tacos, baked taquitos, grilled chicken with grilled veggies, etc. It's also a great way to get your kids (and adults) to eat lots of healthy things, while also making it taste amazing. 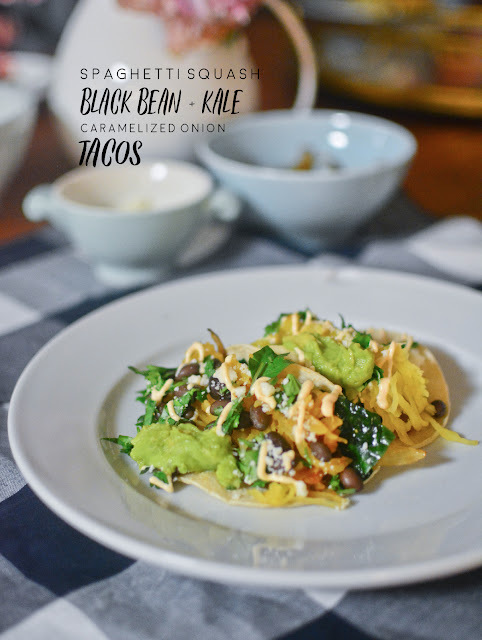 The kale is kind of an adaptation of adding lettuce to a taco, but with triple the nutrients. It's also lightly sauteed so it still has a subtle crunch while also adding great flavor. Try these, I don't think you'll be disappointed! If you're vegan, you can substitute things in the sauce recipe for vegan mayo, cashew / coconut cream and I'm sure it would still be delightful! Or, you could omit the sauce and amp up the guacamole a bit more. Whatever floats your vegan boat! Preheat oven to 375. Cut the squash in half lengthwise, scoop out the seeds and roast the halves (faceside down) on an oiled baking sheet and roast for 40 minutes in the preheated oven. While the squash is cooking, preheat a medium skillet over medium heat. Add 1 Tablespoon butter and a couple of swirls of olive oil (about 1 Tablespoon). Once the butter has melted, add the onions and saute over medium heat until soft and caramelized, about 10 minutes, stirring occasionally. Remove the onions from the pan and set aside. Do not clean pan. Immediately add another couple swirls of olive oil and add minced garlic. Stir for 30 seconds and then immediately add cleaned, chopped kale. Saute for 5-6 minutes until the kale has wilted and is tender. Remove from pan and set aside in a clean bowl. To make sauce: mix all ingredients together in a bowl and pour into a squeeze bottle using a funnel. You can also serve from the bowl, but it's worth it to move to a squeeze bottle for easy serving and storing. Those look good. Love your new blog look too! Made these tonight for dinner......amazing!!! The sauce is the bomb.